Research on thrombin structure and function has progressed significantly over the past three decades. We are continually discovering new functions f()r this enzyme in biology. Yet, until quite recently, a full, detailed, three- dimensional picture of its structure was difficult to attain. We believe that this text represents a turning point and, more appropriately, a new start- ing point for thrombin studies. Our goal for this text is to present a thorough and rounded-out coverage of thrombin chemistry and biochem- istry in order to provide the biochemist and physiologist with an excellent desk reference on almost any thrombin-related problem. 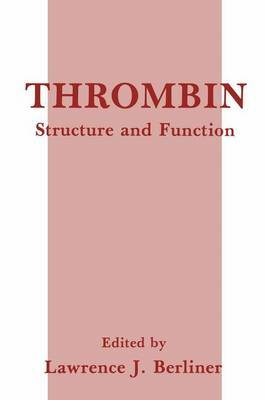 This volume is organized into three general thrombin topic areas: Structure, Biochemistry, and Physiology. In Part 1, Structure, we open with the complete three-dimensional x-ray structures of two inhibited human thrombin complexes, one of which is the thrombin-hirudin com- plex. These complexes are also addressed in the chapter on structural studies in solution, which include NMR, ESR, and fluorescence. Part 2, Biochemistry, includes chapters on synthetic thrombin inhibitors, protein inhibitors (e.g., antithrombin III, hirudin), and thrombin interactions with factor XIII. Part 3, Physiology, covers such topics as chemotactic activities, interactions with cell surfaces, and the vascular endothelium.